The games by Tale of Tales have fascinated me ever since I met Auriea and Michaël at the Innovative Game Design Symposium in 2005. I participated in their Drama Princess workshop and I organised an event during the KunstTour 2006 for which they created a beautiful Abiogenesis performance. So I have to admit, I’m a bit biased when playing their games. Yet even though I’m such a big fan of their work, I didn’t enjoy playing The Graveyard! On the 7th of January the IGF announced its finalists. 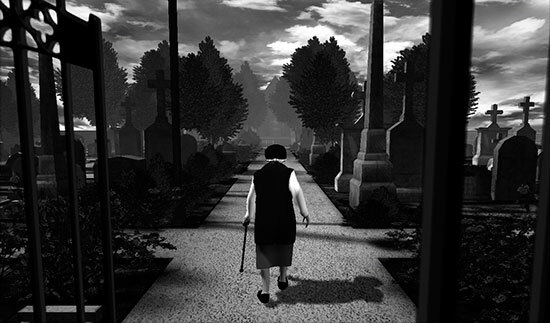 The Graveyard of Tale of Tales is one of the finalists in the category innovation. After the fiasco of their submission of The Endless Forest to the IGF a couple of years ago, I really hope they get the recognition they deserve with this game. But their nomination has motivated me to examine the other finalists further. So the upcoming weeks I’ll be ‘covering’ all the finalists of the IGF, starting with the category innovation.